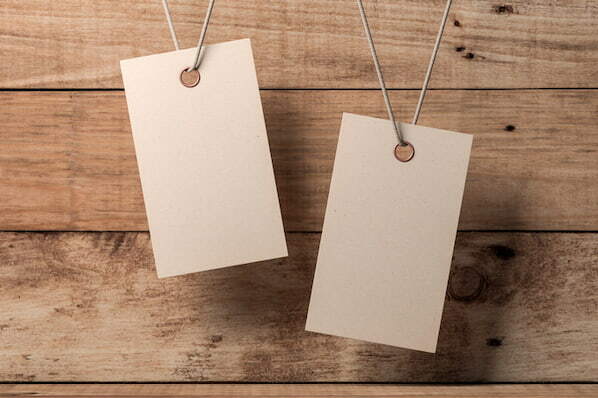 You've probably heard us talk about the benefits of newsjacking for marketing by now. But what about meme-jacking? It's true -- it exists! 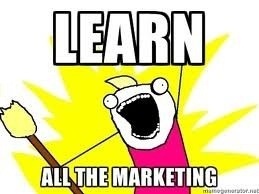 And if you're skeptical about the tactic of using memes in marketing, boy are you in for a treat. Because the topic of memes isn't one that's gotten a lot of face time on this blog in the past, let's start off with a simple definition. A meme is quite simply a concept, behavior, or idea that spreads, usually via the internet. A meme most commonly manifests itself in a visual such as a picture or a video, but it can also take the form of a link, hashtag, a simple word or phrase (e.g. an intentional misspelling), or even an entire website. And the truly successful memes? They spread like wildfire, and they're popularly known. 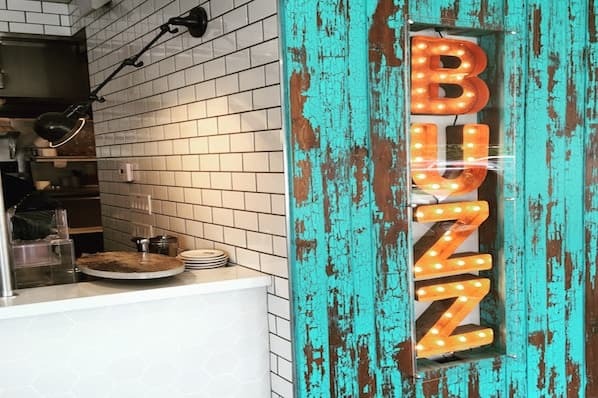 That makes it a little bit more obvious why a marketer might want to leverage these already viral pieces of creative for their own marketing -- especially in social media -- doesn't it? We'll save the do's and don'ts of using memes in your own marketing for another post, but to wet your appetite, let's first take a gander at these creative examples of meme-jacking for marketing. We bet you'll easily recognize a meme or two. 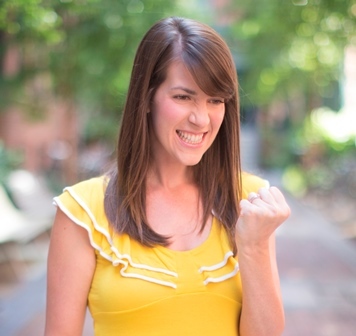 Original Claim to Fame: Aaah, Success Kid. This little dude originally gained internet fame when his mother, Laney Griner, posted a photo to her Flickr account as well as Getty Images in 2007. The photo pictured her then 11 mo. old son Sammy on a beach, clutching a fist full of sand. The image soon spread throughout the web, often accompanied by captions reflecting sentiments of either success or frustration (he's also commonly known as 'I Hate Sandcastles Kid). 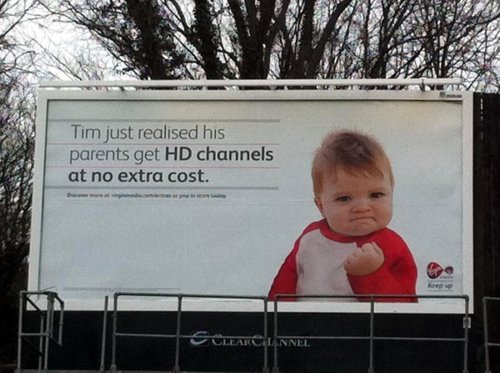 Marketing Claim to Fame: Sammy's -- er, "Tim's" -- photo was featured on a billboard campaign run by British media company Virgin Media in February 2012, with the caption, "Tim just realised his parents get HD channels at no extra cost," perfectly embodying the sentiment for which Sammy's original image is known: success. We also hear that little Sammy is set to appear in an upcoming Vitamin Water campaign in the U.S., so be on the lookout for more baby fist-clenching. Original Claim to Fame: Whoa ... watch out says that internet meme! This ... is ... the honey badger. Posted in January 2011 and accumulating over 45.8 million YouTube views to date, the original video featuring documentary-style footage of the 'nasty' honey badger narrated by a man named Randall is one of the most popular -- and hilarious -- internet memes around. Click here to watch it run in slow motion and gnaw on a king cobra. Marketing Claim to Fame: Wonderful Pistachios snatched up Randall and a honey badger for its memetastic advertising campaign, in which the honey badger cracks open a pistachio using the infamous king cobra. Well played, Wonderful Pistachios, which is known for its ad campaigns featuring celebrities and popular internet memes. Honestly, where does Wonderful Pistachios get such a robust advertising budget? Original Claim to Fame: Like Sammy, Keyboard Cat came onto the YouTube scene in 2007 with its musical stylings. Although the footage is from 1984, and Keyboard Cat (played by Fatso the cat and manipulated by owner Charlie Schmidt) is resting in peace, the original video has more than 24.3 million views to date, and the Keyboard Cat meme is still going strong with a dedicated YouTube channel, regular videos, and a toy in Fatso's honor. Marketing Claim to Fame: Who better to jump on this YouTube sensation than Wonderful Pistachios? We told you they were known to do some meme-jacking. And Keyboard Cat ... "does it purrrr-fectly." Original Claim to Fame: Carly Rae Jepsen's silly yet catchy smash hit, "Call Me Maybe" (if you haven't heard it, beware -- it'll be stuck in your head all day), which debuted in September 2011, has spread like wildfire from its popularity in the U.S. this year and has since sparked a number of internet hits, from the Harvard baseball team's cover video to silly business cards. 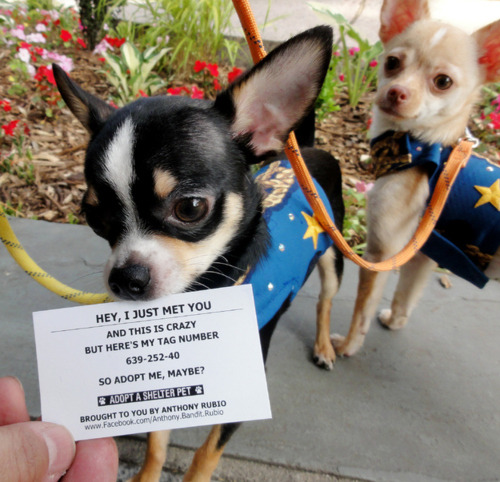 Marketing Claim to Fame: Playing off the business card meme, pet adoption advocate Anthony Rubio posted a picture to his account on photo sharing site imgur.com. The picture, which features Rubio's two chihuahuas, Bogie and Kima, and Bogie holding a business card in his mouth reading "Adopt Me, Maybe?" has generated 370,000 views since it was posted ... which was just several days ago. Rubio's goal is to encourage prospective dog owners to adopt instead of purchasing their four-legged friends from a pet store. Original Claim to Fame: As one of the most recognized characters in 'Rage Comics,' 'Y U NO' Guy has become a prominent internet meme used often in meme generators, embodying SMS shorthand and improper grammar as a form of interrogation. 'Y U NO' Guy bears an enraged facial expression on his stick-figure body, and is thought to originate from Gantz, a Japanese sci-fi manga/anime series. 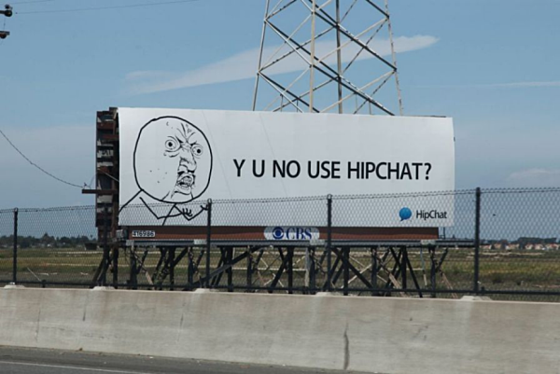 Marketing Claim to Fame: The perfect example of an outbound tactic done right -- and with noteworthy results -- 'Y U NO' Guy became the star of a 4-week long HipChat billboard advertisement in the SF Bay Area. For just under $7K, HipChat reports that the billboard's response "far exceeded [their] expectations," resulting in media coverage (including TechCrunch), a major spike in organic search traffic, and new customers. You can read more about the HipChat's self-entitled 'ridiculous billboard' experience in their account on the HipChat blog. Y U NO CHECK IT OUT? Original Claim to Fame: Adorable musical duo Pomplamoose have made their name primarily on the web, with more than 330K subscribers to their YouTube channel and over 78 million cumulative video views to date. And it's no mystery as to why -- they're charming, quirky, and catchy! Marketing Claim to Fame: Taking a cue from Wonderful Pistachios, the South Korean carmaker Hyundai grabbed a hold of the duo for its 2010 holiday campaign, featuring Pomplamoose singing "Up on the HouseTop." Original Claim to Fame: Talk about internet meme overload! 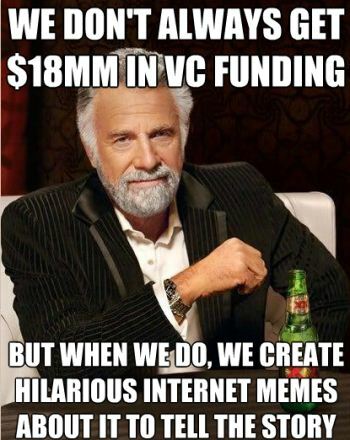 From The Most Interesting Man in the World of Dos Equis to Jean-Luc Picard of Star Trek, the marketing initiative we're about to feature leverages a variety of popular internet memes -- even 'Success Kid'! Marketing Claim to Fame: When SEOmoz announced its Series B round of VC funding in May, you can bet it wasn't going to do it by way of the normal, run-of-the-mill press release. Instead, SEOmoz made its announcement with the aid of a series of popular internet memes. The result? 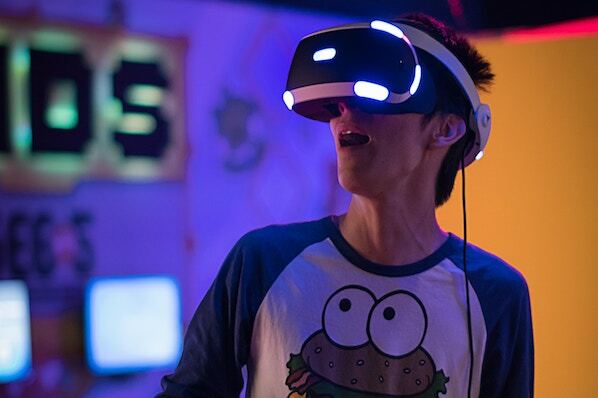 A bunch of media coverage (and quite a bit of admiration from us folks at HubSpot -- and likely elsewhere). Original Claim to Fame: Have you ever heard a 'Chuck Norris Fact' in passing? You may have even uttered one yourself. For the unfamiliar, the popularity of martial artist and actor Chuck Norris has ultimately manifested in the widespread 'Chuck Norris Facts' phenomenon, which consists of satirical, hyperbolic factoids about Chuck Norris that emphasize his masculinity, toughness, attitude, etc. For example: "Chuck Norris was once stabbed by a knife; the knife bled to death." You get the picture. Marketing Claim to Fame: A 2011 commercial for World of Warcraft -- a fantastical, online role-playing game -- features Chuck, featuring its own 'Chuck Norris Facts' in the narration: "Chuck Norris does not hunt; hunting would imply the possibility of failure," and "There are 10 million people in the World of Warcraft, because Chuck Norris allows them to live." Original Claim to Fame: The Old Spice commercial series called 'The Man Your Man Could Smell Like' featuring that 'man' (AKA Isaiah Mustafa) was a marketing campaign in itself for, well, Old Spice. While the advertisement was initially created and debuted in 2010 to market Old Spice's Red Zone After Hours Body Wash, because of its raging success, the campaign was extended to promote Old Spice's other products, and the Old Spice Man lived on. It quickly turned into a popular internet meme and could be found in meme generators throughout the web. Marketing Claim to Fame: While not the only Old Spice Man parody around, DreamWorks featured its Shrek-based character, Puss in Boots playing the Old Spice Man in its 2011 trailer to promote the movie spinoff, Puss in Boots. The TV spot features a mashup of scenes from the series of Old Spice commercials. 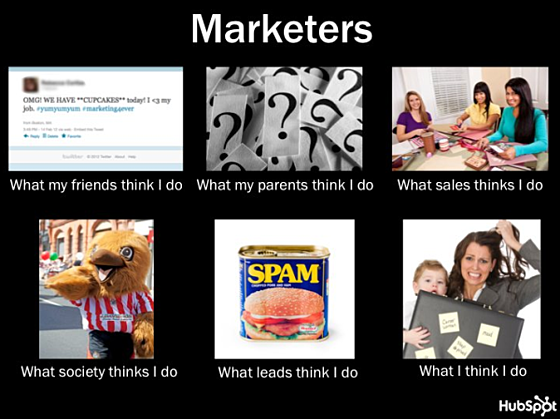 Original Claim to Fame: Finding its way into (and bombarding) the news feeds of Facebook users everywhere in February 2012, the 'What People Think I Do/What I Really Do' meme consists of a series of visual, 2-row charts echoing the two points of view (the common, stereotypical impression of others; and the self-image of the creator) of a particular occupation or expertise. 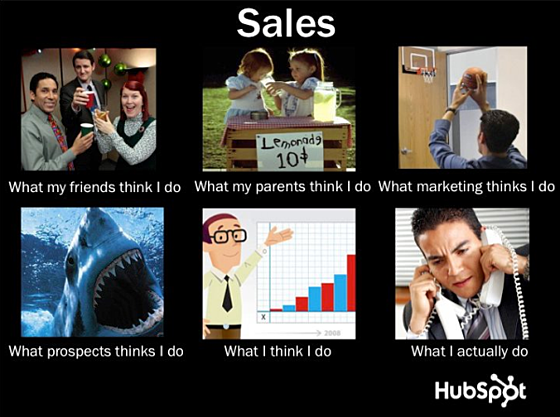 Have you capitalized on popular memes in your own marketing? Share your favorite examples in the comments!